Author, publisher and media executive W. Randall “Randy” Jones died suddenly last Tuesday after a long and, some would say, large life. He was born in Carrollton, Georgia on October 6, 1955, the second son of Sarah (Harwell) Jones and C. W. Jones. Jones spent his formative years on his parents’ farm just north of the city of Carrollton at 43 C. W. Jones Road, but it was far from his small town roots that he made his greatest impact. 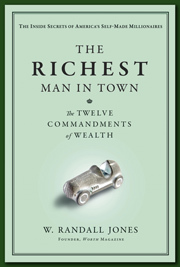 He was best known as the author of the best-selling book The Richest Man in Town: The Twelve Commandments of Wealth, a book that took him all across America interviewing the most successful self-made man or woman in 100 unique American towns. He was quoted in The New York Times as saying, “Writing The Richest Man in Town was the most fun thing I have ever done—it was also the hardest.” Reportedly, it took him over two years to lasso and ultimately interview some of America’s greatest success stories in all 50 states. To Jones, the journey was the reward, however. This endeavor allowed him to feel that he had shared some of the greatest success wisdom—perhaps the most extensive collection ever assembled—with future generations. When the book was published in 2009, he said, half in jest, “I can die now, because I have achieved my life’s work.” Jones was also the author of The Greatest Stock Picks of All Time, the founder of Worth magazine, the CEO of Worth Media, and was the publisher of Esquire magazine. As proud as he was of his career, he was fond of saying that his three sons, Cole, Chancellor, and Charles, were his proudest accomplishment and life’s greatest reward. Jones left his hometown of Carrollton in 1974 to matriculate at the University of Georgia in Athens. The experience of a large university broadened his outlook, and Jones began to see a wealth of opportunities and the promise of a bigger life. He honed his interpersonal and social skills, joining the Kappa Sigma fraternity. He would later recall that it was at the Kappa Sig house that his future wife, then Connie Cole, gave him a football jersey with the nickname “Rover” on the back, a not-so-subtle reminder that he was paying more attention to the needs of others than to those of his girlfriend. It was only one of many times, Jones said, that his wife helped give him a sense of perspective on the important things in life. Jones enjoyed his experiences in the Henry W. Grady School of Journalism, from which he received his A.B.J. degree in 1977. His journalism education left a strong impression on him, and even as the digital age took the world of legacy media by storm, he always believed in the power of the written word. During the summers of his college years, Jones worked as a camp counselor at the Rock Eagle 4-H Center in Eatonton, Georgia and spent his last college summer, in 1976, in Washington, D.C., working at the National 4-H Center, where he acquired a reputation as a whiz at guiding tour groups of young 4-H participants through the halls of Congress and the confusing, Lafayette-designed streets of Washington D.C. Jones’s favorite tour to lead, however, was to the Library of Congress, a foreshadowing of what the future would hold—in 1996, while CEO of publishing company Worth Media, he acquired Civilization, the magazine of the Library of Congress. In his senior year at the University of Georgia, the journalism major was not at all sure what to make of his life. In a chance campus interview that he thought would be just for practice, he was offered a job at Atlanta’s Silver Bear paper company. Without searching further, or exploring alternative opportunities in journalism, he accepted the job. Jones was always attracted to a certain degree of eccentricity, and in the owner of the company, Donald B. McKay (formerly Metzger), he found an intriguing first boss. The job, selling paper products to colleges and universities all across America, gave him a company car, a travel per diem, and the opportunity to hone his sales skills while seeing the country. What could be better, he thought, than traveling to America’s college campuses? He became the company’s top salesman and was promoted to vice president and director of marketing and sales. In his new capacity, he recruited a group of new graduates from his alma mater later that year. At the time, no women had ever worked in a sales capacity for the company, so Jones made sure that half of the new hires were female—a practice he continued throughout his career. He and his new team tripled Silver Bear’s sales, and his success led a headhunter to call him about a job with 13-30 Corporation, a little-known company in Knoxville, Tennessee, that published magazines for the college and young adult market. Hoping to finally be able to use his journalism degree, Jones took the job, commuting to the company’s headquarters in Knoxville from his home in Atlanta several days a week. Deciding that he did not wish to be poor, however, Jones sold advertising for these magazines rather than write for them. In late 1979, his partners at 13-30 bought the venerable Esquire after the magazine had fallen into financial difficulties under the directorship of legendary editor Clay Felker. (Coincidentally, Felker became Jones’s great friend and next-door neighbor on East 57th Street eleven years later.) The purchase of Esquire thrilled Jones, because it was the first magazine he ever subscribed to as a small-town boy far from the creative canyons of New York City. “Esquire was my window into a more sophisticated and erudite world as a young boy growing up in Carrollton, Georgia,” he told the New York Times upon his elevation to the job of publisher while still in his twenties. The 1980s were a period when Esquire was experiencing one of the most heralded turnarounds in the history of publishing. It was also a time when, Jones’s wife recalls, he was working 18 hours a day and traveling constantly. While the mid-’80s were a time of major dedication to his career, they were also a time that defined Jones as a leader, a publisher—and a well-dressed gentleman. He famously looked the part of the publisher of America’s premier men’s lifestyle magazine—one media maven of the time remarked, “He looks like he’s from central casting”—but he lived it, as well. Jones was well cast in his role at Esquire and he loved the job. While he was working hard, however, Jones also showed a capacity for enjoying life and the rewards that came with his position, a joie de vivre that informed his second book, The Richest Man in Town. He enjoyed traveling to the fashion shows in Milan and Paris, and came to love the cuisine as he dined in the best restaurants in Italy and France. His family affectionately recalled his enthusiasm for “the latest toys,” and his regular attendance at the Consumer Electronics Show in Las Vegas and the National Automobile Dealers Association meetings each year. His greatest appreciation during the Esquire years, however, was reserved for the access it afforded him to many of the best and brightest writers of the time—among them Gay Talese, Tom Wolfe, Norman Mailer, and Truman Capote. He also took particular cultural enrichment from trips to Singapore, Hong Kong, and Japan. In 1988, the Henry W. Grady School of Journalism at the University of Georgia, honored Jones with its highest award, the John E. Drewry Award for distinguished achievement in journalism. He was again said to be stunned when the University of Georgia presented him with the Alumni Merit Award—the highest honor awarded to an alumnus—in 2002. As the youngest publisher of a major magazine in history, Jones often reveled in how he had found his “perfect pitch” in the publishing business. He remembered proudly the 50th-anniversary issue of Esquire, titled “50 Who Made a Difference,” in which the magazine celebrated the 50 people who over the past 50 years had most changed the way Americans live life and perceive life. It was a record-shattering issue, with more than 700 ad pages, making it the most profitable issue of Esquire in history. He credited his many friends and colleagues who were so important to Esquire’s success—Phillip Moffit, Chris Whittle, Alan Greenberg, Lee Eisenberg, Martha Mosko, Mike Mulhearn, Alison Parks, Cheryl MacLachlan, Jack Jackson, Bill Longley, Cindy Still, and Dan O’Shea, to name but a few. Then the divorce happened—Chris Whittle and Phillip Moffitt, the two controlling owners of Esquire and 13-30 Corporation, parted company. In simplest terms, Whittle took control of 13-30 and Moffitt kept Esquire. Jones, who was having the time of his life as publisher, remained at the magazine with Moffit. Then, in late 1986, in order to take advantage of changing corporate tax rates, Phillip Moffit and the Esquire Magazine Group board, including Lord Harmsworth, of Associated Newspapers of London, decided the time was right to sell the magazine. They hired Bruce Wasserstein—known as “Bid-’Em-Up Bruce” among industry insiders—of Wasserstein-Perella, the hot M&A shop of the 1980s, to find the perfect home for the magazine. The winner was the Hearst Corporation, owned by the trust of the late legendary newspaper publisher, William Randolph Hearst. By this time, Hearst had become much more than a newspaper publisher; they were the second-largest magazine company in the country, behind Time Inc. Esquire added a shot of testosterone to Hearst’s stable of esteemed magazines, such as Cosmopolitan, Town and Country, Good Housekeeping, and Harper’s Baazar. Jones happily stayed with the magazine, continuing to run it for four years after the sale to Hearst. He liked working for George Green, Gil Mauer, and Frank Bennack, and insisted that Frank Bennack was the smartest man and best public speaker he had ever met. Jones often commented to his colleague Alison Parks, “Someday I want to be that good!” He confided to many, however, that he never felt he achieved that goal of beating Frank Bennack in the speaking department. During that time, howver, he did achieve something far more important: on February 6, 1989, he became a father for the second time when William Chancellor Jones was born. Just as these ideas were swirling in his mind, Ned Johnson and Jim Curvey of Fidelity Investments entered the scene. In 1991, Jones knew Fidelity Investments as the manager of his 401(k) plan, but little else. That changed when Bill Holodnak, president of the Boston-based headhunting firm J. Robert Scott, called and asked Jones if he would be interested in running a small publishing company owned by the venture capital arm of the world’s largest mutual fund company, headquartered in Boston. TO BE CONTINUED: Watch for the founding of Worth; the birth of Charles Edwin Jones; the purchase of Civilization magazine; the founding of The American Benefactor; the test of Equity magazine; the dot-com bubble and Worth.com; buying out Fidelity; The Greatest Stock Picks of All Time, The Richest Man in Town, and more.